The following represents the application architecture diagram (communication flow viewpoint) representing communication between Spring Boot app and Amazon Polly, Amazon S3 and Twilio Service to achieve automated phone alerts based on text-to-speech conversion. // Create describe voices request. // Synchronously ask Amazon Polly to describe available TTS voices. An instance of PutObjectRequest which is intantiated with AccessControlList and ObjectMetaData instances. Twimlet URL which is created using voice URL which will be accessed to play voice file to the destined phone number. From and To phone numbers which are required for making phone calls. AWS Access Key properties; This is stored as empty string. The code uses AWS security temporary credentials for accessing AWS services. Twilio account SID, auth token values and phone number from which the call would be made. Note that this phone number needs to be purchased from TWILIO web console. Pay attention to the different set of files used for creating configuration beans for AWS and Twilio services. AWS Security credentials provider which can be created using AWS Security Key ID and security key access. Pay attention to creation of the Bean of type, TwilioRestClient which can be used for instantiating Twilio services. 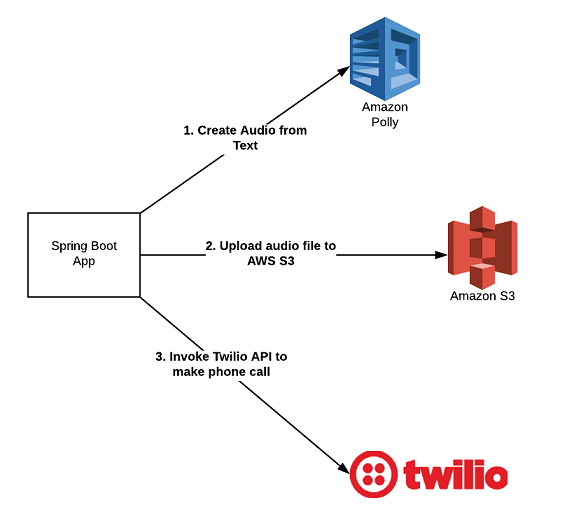 In this post, you learned about invoking Twilio API from Spring Boot Java app to play audio to a destined phone number, with audio being created using Amazon Polly service and uploaded on AWS S3 bucket. Did you find this article useful? Do you have any questions or suggestions about this article in relation to integrating Amazon Polly with AWS S3 and Twilio API using Spring Boot Java app? Leave a comment and ask your questions and I shall do my best to address your queries.